Opening Day at the 2017 Hawaii State Legislature. Synopsis: Appropriates funds for the operating and capital improvement budget of the Executive Branch for fiscal years 2017-2018 and 2018-2019. Status: (5/02/2017) Passed final reading in the Senate (as amended CD1). 25 Aye(s) with reservations: none. 0 No (es): none. 0 Excuse: none. Passed final reading in the House (as amended CD1) with Representative(s) Oshiro, Say, and Ward voting aye with reservations; none voting no (0) and none excused (0). Received notice of passage of final readings (Hse. Com. No 642 and Sen. Com. No. 736) and transmitted to Governor on 05/03/17. Complete 2017 Legislative history of HB 100 can be found by clicking here. More details of the Budget Bill on our DHHL Budget page. Synopsis: Reduces the minimum Hawaiian blood quantum requirement of certain successors to lessees of Hawaiian home lands from one-quarter to one thirty-second. Status: (As of 05/03/2017) Passed final reading in the Senate as amended (CD1). Aye(s) , 25; Aye(s) with reservations: Senator(s) L. Thielen. Noes, 0 (none). excused, 0 (none). Passed final reading in the House as amended (CD1) with Representative(s) Lo Presti voting aye with reservations; none voting no (0) and Representative Ichiyama excused (1). Transmitted to the Governor on 05/03/17. Click here for the complete history of HB451 during the 2017 Legislative session. Status: (As of 03/17/2017) Awaiting a hearing to be scheduled by the House Committee on Judiciary (JUD). Synopsis: Amends the Hawaiian Homes Commission Act to reduce the number of commissioners that are residents of the city and county of Honolulu and adds a commissioner from the island of Lānaʻi. Status: (As of 3/22/2017) Awaiting a hearing to be scheduled by the Senate Committee on Judiciary (JUD). Synopsis: Authorizes the legislature to reclassify certain agricultural lands and transfer them to DHHL or OHA. Status: (As of 1/27/2017) This measure was deferred by the House Committee on Agriculture (AGR). Click here for a copy of the testimony presented before the AGR vote. Synopsis: Lowers the required blood quantum to one-thirty-second Hawaiian for the lessee’s relatives currently eligible to succeed to a lease with one-quarter Hawaiian including a lessee’s husband, wife, children, grandchildren, brothers, or sisters. Requires Congressional approval. Status: (As of 3/9/2017) This measure died in the Senate and cannot be considered until next legislative session. Synopsis: Specifies certain content of Department of Hawaiian Home Lands homestead applicant and lessee files are not required to be disclosed. Status: (As of 3/9/2017) After passing out of the House Committee on Ocean, Marine Resources, & Hawaiian Affairs (OMH), the bill was not schedule for a hearing by the House Judiciary Committee (JUD) and died in the House. Status: (As of 3/9/2017) After passing out of the Senate Committee on Hawaiian Affairs (HWN), the bill was not schedule for a hearing by the Judiciary & Labor Committee (JDL) and died in the Senate. Status: (As of 3/10/2017) After passing out of the House Committee on Ocean, Marine Resources, & Hawaiian Affairs (OMH), the measure did not get a hearing from the House Committee on Judiciary (JUD), and died in the House. However, the Senate companion SB961 made a successful crossover to the House. Synopsis: Authorizes general obligation bonds and appropriates funds to the Department of Hawaiian Home Lands for redevelopment of the Bowl-O-Drome property, located at 820 Isenberg Street, with the assistance of the Hawaii Community Development Authority. Status: (As of 3/10/2017) After passing out of the House Committee on Ocean, Marine Resources, & Hawaiian Affairs (OMH), the bill was not scheduled for a hearing by the House Finance Committee (FIN) before the crossover deadline and died in the House. Synopsis: Establishes a working group to address and provide findings and recommendations regarding issues that beneficiaries of the Department of Hawaiian Home Lands on Hawaii Island face relating to the financing and insuring of homes. Appropriates funds. Synopsis: Allows the Department of Hawaiian Home Lands to retain independent legal counsel as needed. Status: (As of 3/9/2017) The bill died in Senate chambers after not being scheduled before the crossover deadline by any of the Senate Committees to which it was referred this session. These include the Committees on on Hawaiian Affairs (HWN) or Judiciary & Labor (JDL); as well as Ways & Means (WAM). 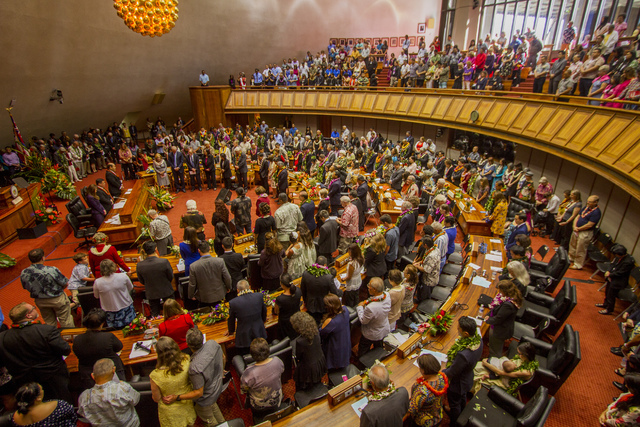 Synopsis: Amends the membership of the Commission on Water Resource Management (CWRM) to add the chairperson of the Hawaiian Homes Commission or the chairperson’s designee to serve as an ex-officio voting member. Status: (As of 3/9/2017) The bill died in House chambers after not being scheduled before the crossover deadline by any of the House Committees to which it was referred this session. These include the Committees on Ocean, Marine Resources, & Hawaiian Affairs (OMH), Water & Land (WAL); and Finance (FIN). Status: (As of 3/9/2017) After passing out of the Senate Committees on Hawaiian Affairs (HWN) and Water & Land (WTL) the bill was not scheduled for a hearing by the Senate Ways and Means Committee (WAM) before the crossover deadline and died in the Senate. Synopsis: Appropriate funds to various housing agencies to improve the quality of existing public and affordable housing stock and increase the supply of affordable and public housing units in the State. Status: (As of 3/9/2017) After passing out of the House Committee on Housing, the measure was not scheduled for a hearing by the House Finance Committee (FIN) before the crossover deadline and will no longer be considered this legislative session. Synopsis: Authorizes the issuance of general obligation bonds for construction and infrastructure development projects to provide affordable housing units for middle class and low-income residents. Allows moneys from the conveyance tax and the county surcharge on state tax to be used to repay the bonds. Status: (As of 3/9/2017) After passing out of the House Committee on Housing (HSG), the measure was not scheduled for a hearing by the House Finance Committee (FIN) by the crossover deadline and died in the House. Status: (As of 3/9/2017) After passing out of the House Committees on Transportation and Energy (TRE) and Housing (HSG), the measure was not scheduled for a hearing by the Senate Ways and Means Committee (WAM) by the crossover deadline and died in the Senate. This proposal would lower the blood quantum to one-thirty second Hawaiian for the lessee’s relatives currently eligible to succeed to a lease with one-quarter Hawaiian including a lessee’s husband, wife, children, grandchildren, brothers or sisters. DHHL continues to receive requests from beneficiaries, particularly lessees in our older homestead communities, to reduce the blood quantum requirement for successors. As these communities age, the lessees with one-quarter Hawaiian are facing the possible loss of a homestead lease that has been within the family for several generations because their descendants lack the required blood quantum. This amendment will provide lessees with greater flexibility to retain homestead leases within their families. The second proposal specifies that certain content of DHHL’s homestead applicant and lessee files are not required to be disclosed to the public. DHHL has received Uniform Information Practices Act (UIPA) requests for specific homestead application files and homestead lease files that include personal contact information, genealogies, finance and loan documents, and other correspondence. DHHL’s administrative rules require that “personal data received or recorded by the department shall be held in absolute confidence and no release of information shall be made without written approval of the individual concerned.” Public access to this information should be considered an unwarranted invasion of privacy. This proposal would further protect the interest of Hawaiian home land applicants, lessees, and their successors by protecting information in which they have a significant privacy interest. The third proposal changes the composition of the HHC by reducing the number of commissioners that are residents of the City and County of Honolulu and adding a commissioner from Lanai. The HHC is currently composed of nine members, and at least one member is a resident of each island on which DHHL has land with the exception of Lanai. DHHL acquired 50 acres on Lanai in 1999 and awarded 29 leases and has 66 applicants awaiting lease awards. However, there is no provision for a member of the HHC to be a resident of Lanai. This proposal would provide for a more direct connection for native Hawaiian beneficiaries on Lanai to the HHC. The fourth proposal allows DHHL to retain independent legal counsel to be paid by the State and also use the services of the attorney general as needed when the interests of the State and DHHL are aligned. DHHL has a trust duty to its beneficiaries and in the fulfillment of its trust obligations, DHHL may at times be at odds with the interests of the State. It is at these times that DHHL must be assured that its counsel provides legal guidance strictly in the interest of its client. Independent counsel that is hired and retained by DHHL eliminates any cloud of uncertainty that there is a conflict of interest that DHHL is represented by the Attorney General’s office that also represents the State. The final proposal would add the Chairman of the Hawaiian Homes Commission or the Chairman’s designee to the Commission on Water Resource Management (CWRM). The Water Code requires that planning decisions of the CWRM ensure that sufficient water remain available for current and foreseeable development and use of Hawaiian Home Lands. In order to further the interest of beneficiaries of the Hawaiian Homes Commission Act, the Chairman of the Commission or the Chair’s designee should serve as an ex-officio voting member of the CWRM.